For a dramatic accent, our fashionable 70% cashmere pashmina / 30% silk blend shawls, wraps, stoles or scarves can't be beat. The silk adds a nice sheen and our pashmina/silk blends are classic 2 Ply, except for our single-ply Water style. 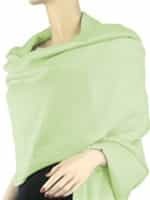 The luxurious pashmina/silk blends that The Pashmina Store offers are sometimes called summer pashminas because they are so light-weight that they can be worn even on a cool summer's evening. This makes them very popular for weddings and as bridesmaid gifts. We have several fashionable colors available, so be sure to order your new pashmina today! If you can't decide what to give, The Pashmina Store offers gift certificates! Your lucky gift recipient can choose the perfect pashmina shawl, scarf, wrap or cashmere blanket for themselves.